Students must choose the number that represents the word name given in this Add with Pictures- up to 5 Math Test to review and check knowledge. This test has beautiful and colorful pictures. It's fun and presented in the form of multiple choice questions. Students can count the pictures or they can add the numbers and check their results by counting the objects. There are several ways of approaching this test. Represent addition and subtraction with objects, fingers, mental images, drawings, sounds (e.g., claps), acting out situations, verbal explanations, expressions, or equations. 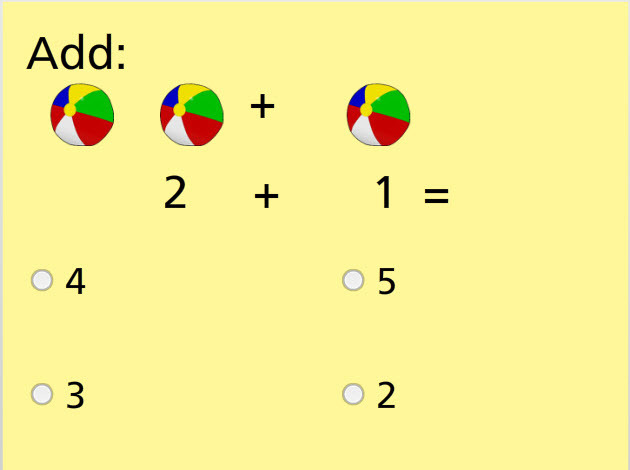 Return from this Add with Pictures- up to 5 Math Test to the Elementary Math Tests , Kindergarten Math Tests webpage, or to Math Tests.